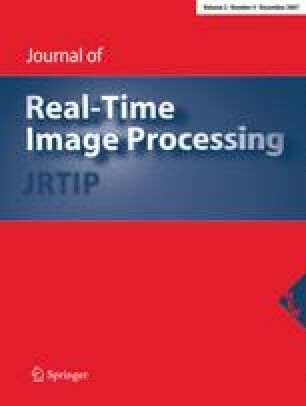 The trace transform is a novel algorithm that has been shown to be effective in a number of image recognition tasks. It is a generalisation of the Radon transform that has been widely used in image processing for decades. Its generality—allowing multiple functions to be used in the mapping—leads to an algorithm that can be tailored to specific applications. However, its computation complexity has been a barrier to its widespread adoption. By harnessing the heterogeneous resources on a modern FPGA, the algorithm is significantly accelerated. Here, a flexible system is developed that allows for a wide array of functionals to be computed without re-implementing the design. The system is fully scalable, such that the number and complexity of functionals does not affect the speed of the circuit. The heterogeneous resources of the FPGA platform are then used to develop a set of flexible functional blocks that can each implement a number of different mathematical functionals. The combined result of this design is a system that can compute the trace transform on a 256 × 256 pixel image at 26 fps, enabling real-time processing of captured video frames. This work was partially funded by the UK Research Council under the Basic Technology Research Programme (GR/R87642/02) and by the EPSRC Research Grant (EP/C549481/1).